How Do I Get The Press To Cover My Company? Sure, you are in love with your company, but you won’t be successful unless you get noticed by the rest of the world–and that starts with getting some coverage in the media. CMO of Gannett Maryam Banikarim and cofounder of fashion site Zady, Maxine Bédat answer this week’s reader question. It’s not enough to have a great business if no one knows your company exists, but getting the media to pay attention to your startup can be tricky. Is It Time To Move On Or Should I Try For A Promotion? This week’s reader question is about the best methods for reaching out to the press, and is answered by CMO of Gannett Maryam Banikarim and cofounder of fashion site Zady, Maxine Bédat. What’s the most efficient and effective way to find and reach out to bloggers in my niche so they will consider writing about my company? If you are starting from scratch, a quick Google search will help you get a list of relevant bloggers started. Search things like “top 10 bloggers” and the name of your industry. This will be the first step. After you have created a list of bloggers and journalists who write about companies like yours, sign up for an RSS feed of their blogs and follow them on social media. Next, dig deeper to find who they are following and follow that expanded network as well. As you follow who they follow, the universe of your particular niche will emerge. Get in the habit of reading the blogger entries every day, you can make it part of your morning ritual. This will help you determine which blogs are most relevant for your company. Connecting with relevant bloggers is more important than connecting with bloggers with the largest reach. Frame your communication not about what they can do for you, but what your company can do for their readers. For our sustainable fashion company Zady, we focused our attention on the bloggers that share our lifestyle and our aesthetic. By connecting with like-minded bloggers, it made it that much easier to build a genuine relationship based on mutual interest. Start building that relationship on social media. Maybe it’s commenting on something on Twitter or re-pinning on Pinterest. Continue to do this for several weeks. After several interactions, they will get to know you and hopefully appreciate your point of view. Once you have developed that interaction, you can reach out to bloggers through email or through their contact on their site, whatever is accessible to you. Just be sure, once you do reach out, to not frame your communication about what they can do for you, but what your company can do for their readers. 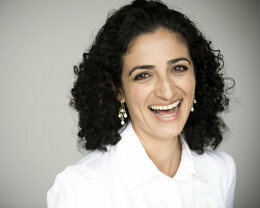 Maryam Banikarim is the Senior Vice President and Chief Marketing Officer of Gannett. She has been named one of the 50 Most Powerful Women in NYC by the New York Post and is one of Fast Company‘s Most Creative People in Business 1000. There are four steps to getting coverage–be it with a big media outlet or a blog. Make sure the outlet does these types of stories. For example, you wouldn’t pitch People magazine the same story you would pitch the Wall Street Journal. I generally have several options for where I want a story to appear–listed in priority order. Once you have picked the outlet you think makes sense pay attention to the bylines. You aren’t pitching a generic outlet. You are pitching “a person.” Take the time to read several of their most recent stories–the more you understand this person and what they cover, the better your pitch will resonate. A reporter has the right not to be interested. So if you try once or twice and get nowhere be respectful and move on. Put yourself in the shoes of the person you want to pitch and then craft your story. Reporters are busy so be brief and to the point. You can send your pitch via email/Twitter/LinkedIn. But I also like to follow up by phone. A reporter has the right not to be interested. So if you try once or twice and get nowhere be respectful and move on. You don’t want to burn your bridge–you may want to come back to this person for another pitch. And one final note, it’s always a good idea to find out if anyone in your network knows the reporter/blogger you want to get to. An introduction always helps. Good luck and let the pitching begin!